It’s up there. Out there. The whole bandobast. Everything you ever dreamed of and will never have. The vastness. The incomprehensible. The incalculable. The mystery. Of the Cosmos. Whatever’s not working we ‘ll fix it later. The super-sized dithering universe and everything in it. Forget it. Carl Sagan. Everybody. We needn’t concern ourselves. With what? With this. We’ve got a little bit of Cosmos right down here. Cosmos bipinnatus. Take a picture, Heatherington. Get the lead out. These people don’t have all day. That’ll do for now. I thought you said you knew something about photography. You know. These long green-stemmed thingees that grow up and explode in late season with these brilliant pink flowers with the yellow bitzy things in the centre. Cosmos. Native to Mexico, apparently. That’s Mexico Lindo to you, Mr. Stanton, if that in fact is your name. Old Mexico. These ones aren’t in Mexico. If they were naturally I’d feel some concern for them because Mexico is a tough country. Esta un infierno, mi amigos. Some day we’ll learn proper Mexican Spanish. Cosmos is about time. Not about clocks or watches. Time. A flower so vast and intricate and a pink example of something that just is. You don’t have to get it. Señoras and Señors and all you muchachas and muchachos and niñas and niños along for this joy-ride. It’s for you. Exactly like that. I didn’t believe it myself. That a plant could be called “Cosmos”. It’s almost as bad as “Cleome” and that’s totally unbelievable. We’re gonna slow things down a little bit here. 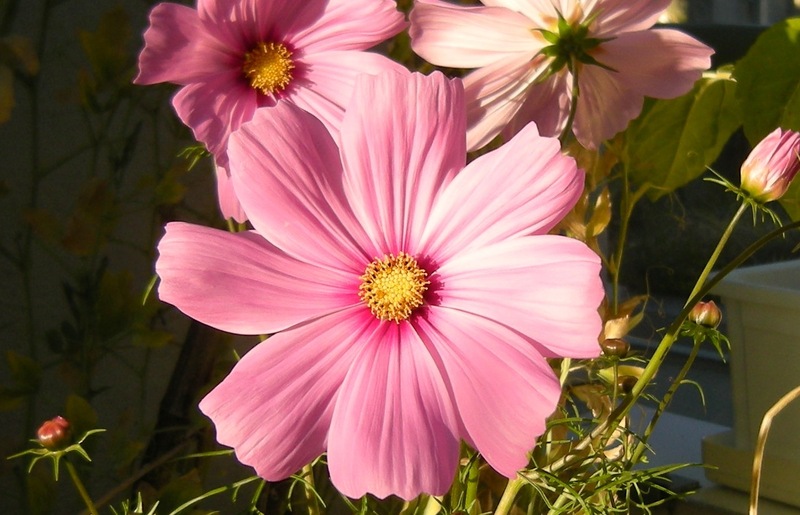 This entry was posted in Certainties and tagged Carl Sagan, Cosmos, Cosmos bipinnatus, Mexico. Bookmark the permalink.